The cheetah’s defining trait is her lightning speed. No other land creature can match her for raw pace and explosive power, but she most certainly is a sprinter, not an endurance runner. Her whole hunting technique is built upon short sprints that take her prey by surprise. Her perfectly evolved physiology combined with the challenges of her habitat mean she can’t sustain a lung-busting run over long periods. Cheetahs are only able to chase prey at top speed for a few hundred yards. 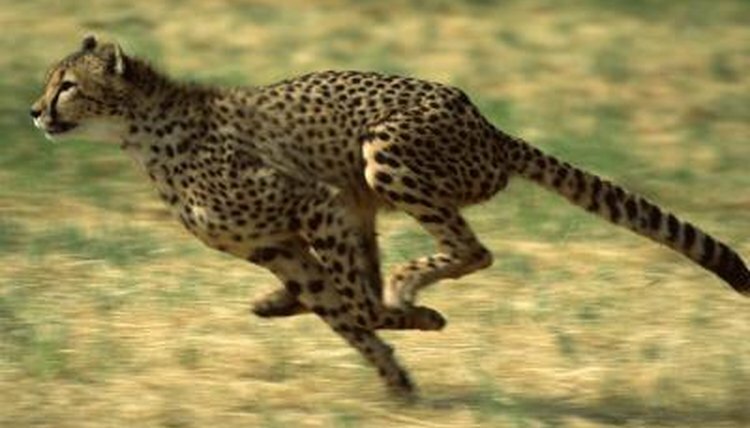 The exact distance a cheetah can run before needing to rest varies according to a range of factors. In intense heat, she will tire quickly. This is why she prefers to hunt at dusk and dawn. Running on rocky or sandy soil is harder work, meaning the cheetah won’t be able to keep up a sprint for as long as she can on flat, smooth terrain. A cheetah can reach a top speed of around 70 miles per hour in about 4 seconds. The ease with which she achieves this speed depends entirely on her health, the terrain on which she's running and her energy levels. If she hasn’t eaten for a while, she simply won’t have the fuel in her body to ignite her turbocharged engine. San Diego Zoo has a cheetah run that is 330 feet long. The zoo claims this is the perfect distance for the cheetah to hit top speed. Over longer distances, a cheetah will struggle to maintain her top speed without risking total exhaustion. Her large heart and nostrils enable her to accelerate swiftly, but these attributes don’t lend themselves to endurance running. If forced to chase prey over greater distances, she’ll quickly slow down, although her prey may also become tired at this stage, meaning she can probably still catch them. The cheetah is a solitary hunter so, unlike lions, she has to do all of the chasing and killing herself. This means she needs to conserve as much energy as possible. To do this, she gets as close to her prey as possible before starting to run. Stealth and timing are as crucial as speed for a cheetah. Using the cover of tall grass and positioning herself downwind to avoid detection, she sneaks up on her prey, saving her energy for that final burst of speed required to get her paws on the prize.